My goodness. What a book. Devastating; beautiful; gripping. All the adjectives, folks. 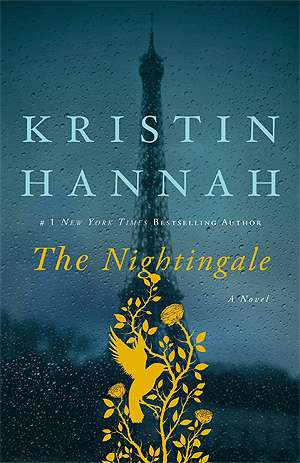 Before publishing The Nightingale (436 pages, 2015), Hannah was better known for writing stories that had a heavy romantic element. With this book, she dives into classic historical fiction territory and hits the ball way outta the park. The various plot points are based on accounts of real women’s experiences in France, including that of Andree de Jongh, who helped establish an escape route for Allied soldiers who’d been trapped in Nazi territory, as well as countless tales of women whose homes were requisitioned by German officers while their husbands were fighting for freedom. If you enjoyed All the Light We Cannot See by Anthony Doerr (550 pages, 2014), which I bet you did if you’ve read it, you’ll also love this one. When you look up the best historical novels of WWII, these are two that show up again and again. Do yourself a favor and make sure you read both. P.S. The Nightingale also made me excited to dig into recently released The Saboteur: The Aristocrat Who Became France’s Most Daring Anti-Nazi Commando by Paul Kix, which has gotten rave reviews, and is patiently waiting on my bookshelf. P.S.S. Kristin Hannah has a brand new book out that’s getting good reviews: The Great Alone, set in 1970s Alaska. Of any single 4-month period in U.S. history, perhaps none was more fraught than mid-April through mid-August of 1945. When beloved Franklin Delano Roosevelt died on April 12th, Harry S. Truman was thrust into that highest office, and handed the following major world events: German surrender and Victory in Europe Day; the development, testing, and use of the only two nuclear bombs ever used as wartime weapons; intense negotiations with Churchill and Stalin about the restoration of Europe (which FDR had been part of first, and didn’t fill in Truman on at all); the founding of the United Nations; and to cap it all off, Japanese surrender and Victory in Japan Day. All of that happened in a single 4-month period. I can’t imagine the stressors Truman felt in those months, especially because FDR and HST weren’t close at all; he was the VP choice because FDR was sick of his old running mate, and Harry was the safest bet among a number of mostly unsavory choices. 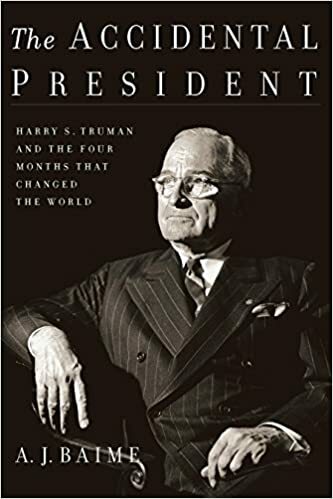 The Accidental President (346 pages, 2017) briefly covers Truman’s biographical details, but it’s primarily a close look — sometimes minute by minute on especially important days — of those four months. If I had to give a critique, I’d say I wished there was more about the ramifications later on of some of Truman’s decisions from that time period. The story pretty much stops come Japanese surrender. To get all of those details, and more about Truman’s life before politics, I plan on someday reading David McCullough’s mammoth Truman (1,120 pages, 1992), which is not yet on my shelf, but surely will be soon. That title won a Pulitzer and did quite a bit to restore Truman’s reputation as President. P.S. There’ll probably be another presidential bio next week — I’m currently in the middle of H. W. Brands’ Reagan (~750 pages, 2015); sorry in advance, but I can’t get enough right now. Don’t worry, though, I’ll still keep things interesting for you and there will be at least one other good book that I finish in the next week. I ended up with 11 finished books in January, though two of those were rather short (The Cricket on the Hearth and The Affections). The longest book I finished (though I’d been working on it for a few months) was Walter Isaacson’s Leonardo da Vinci, at just under 600 pages. I always find particular satisfaction is finishing a big book. What did you read this month and enjoy? I’d love to hear from you. If you’re enjoying this newsletter, I’d sure appreciate you sharing with someone you think may also enjoy it! The easy URL is tinyletter.com/jeremyanderberg. This entry was posted in Uncategorized by Jeremy. Bookmark the permalink.